I made these beautiful hand towels this year as a hostess gift for my friend. Now, I’m happy to provide this crochet edged dish towel tutorial so you can make your very own! Handmade gifts say thank you in the most heart felt of ways, and also carry such meaningful wishes from the giver. Actually, I have two patterns to share with you, both a scallop trimmed edge and, also, a picot trimmed edge. They both start with a foundation blanket stitch and a row of single crochet chain. Finally, you finish the towels off with one more row for either pattern. Tie them up with twine and a sprig of something and they are ready to gift. Also, think about making a stack of them so you always have a gift on hand! 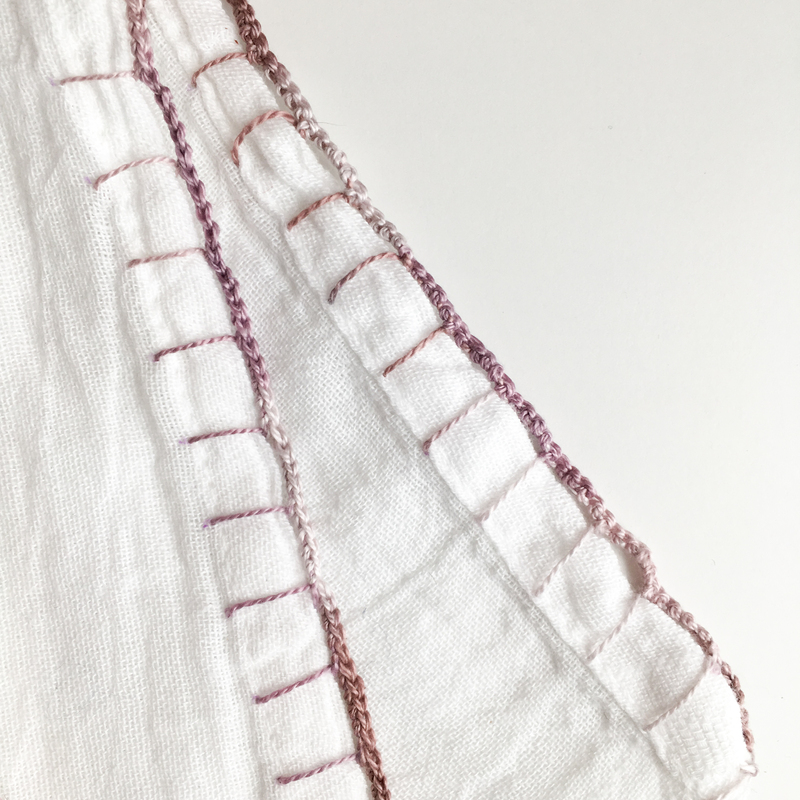 In addition to the delicate crochet, the hand-dyed Valdani embroidery thread adds charm and interest to these simple towels. 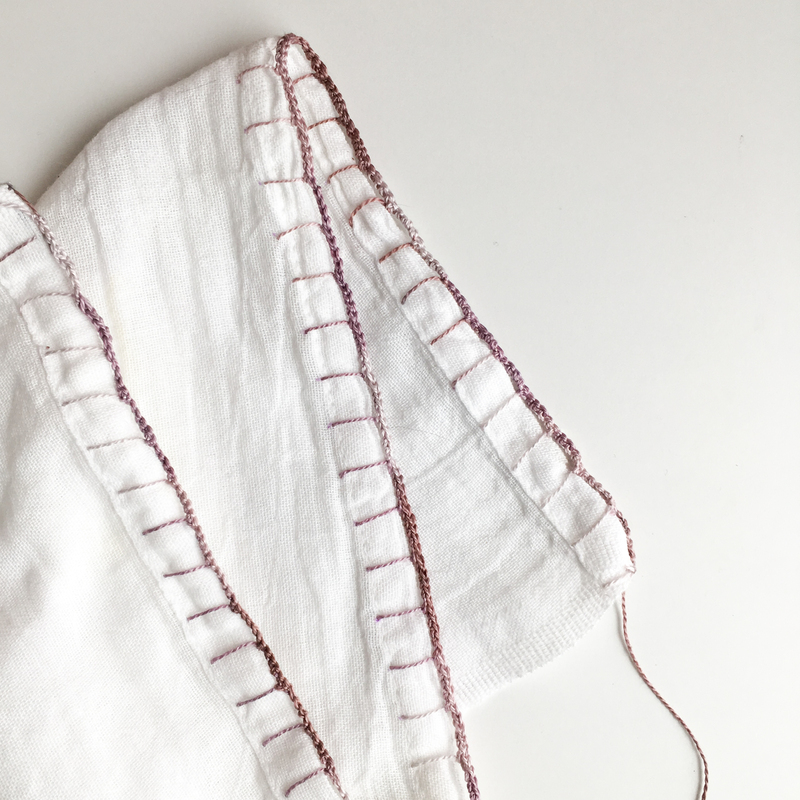 The blanket stitch provides a foundation for the trim at the edge of the towel. 1. With a water soluble marker, mark small dots across the base of the towel. In this case, I placed the spots at the base of the hem of the towel, 1/2″ in from the edge and 1/2″ apart. Though sometimes unwieldy, I find it easiest to blanket stitch the entire edge of the towel with one length of thread. 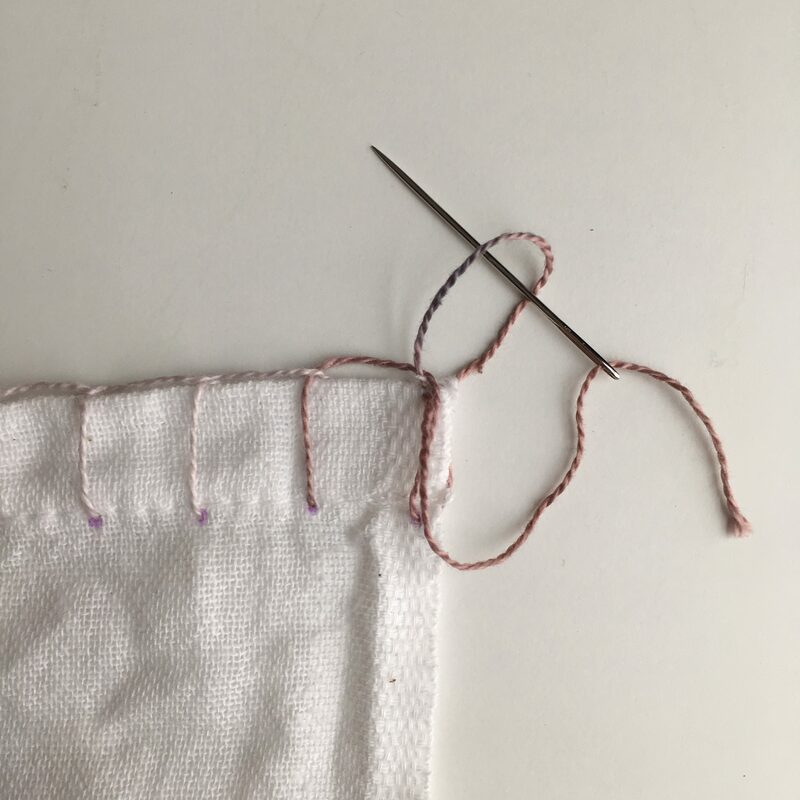 In addition, to ensure you have enough thread to make it across, measure a length of thread that is 3.25 times the width of the towel and thread your needle. 2. Start at the right hand edge of the towel, and with the towel edge facing up and the dots facing you. Bring the needle and thread from the back to the front through the mark farthest to the right. Pull thread through, leaving an 8” tail of thread hanging on the at the back of the towel. Also, next, put your needle from the front to the back through the mark to the left of where your thread currently comes out, keeping the rest of the thread to the the left and behind the needle. Pull the yarn through, catching the thread from the prior stitch. Your first stitch will look off and loose, but we’ll get back to it at the end. 3. 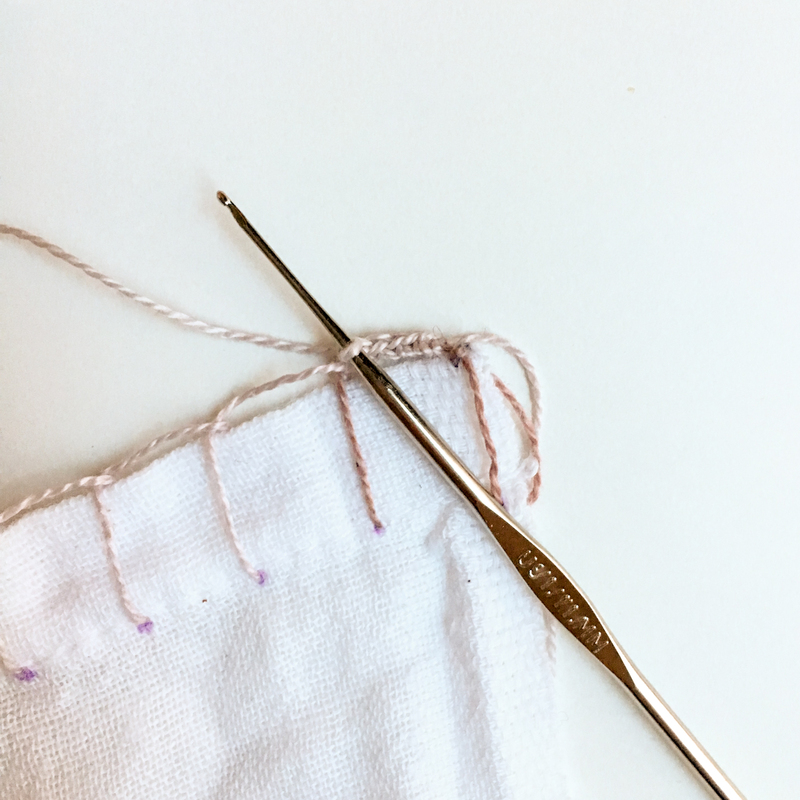 Continue to put your needle in the mark to the left of where you last came out, always keeping the rest of the yarn behind and to the left of the needle, so you catch the prior stitch as you go. 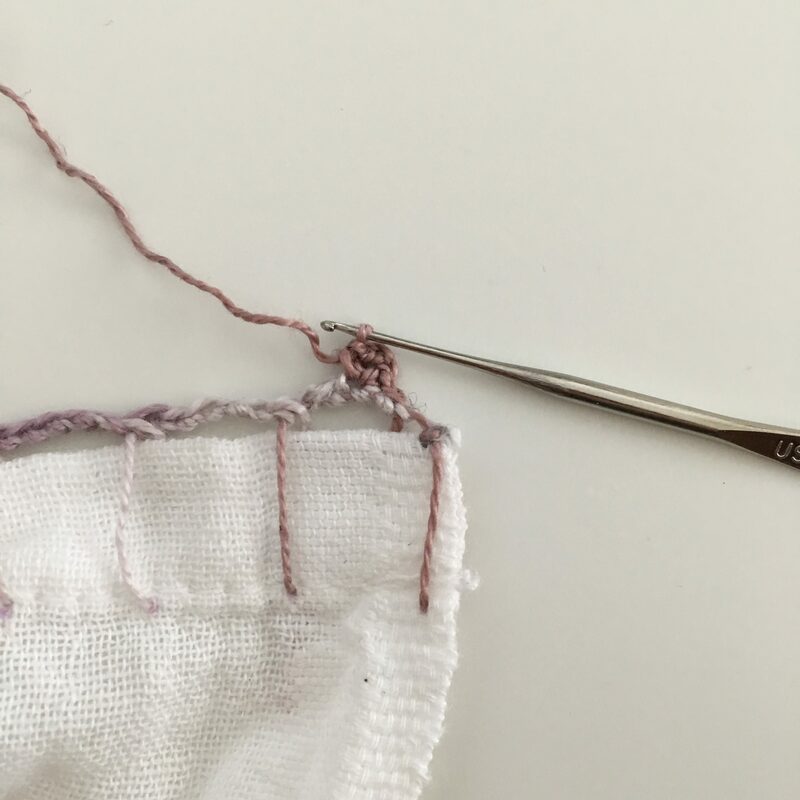 Tighten such that the prior stitch tightens across the edge of the towel and then perpendicular to that. 4. 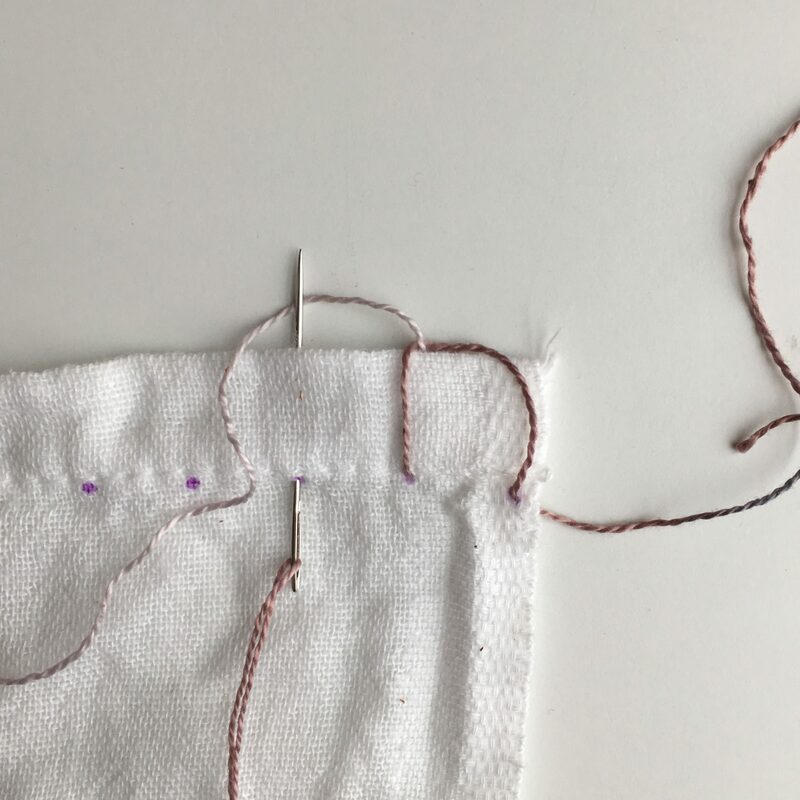 Continue with the blanket stitch across the width of the towel until the end. 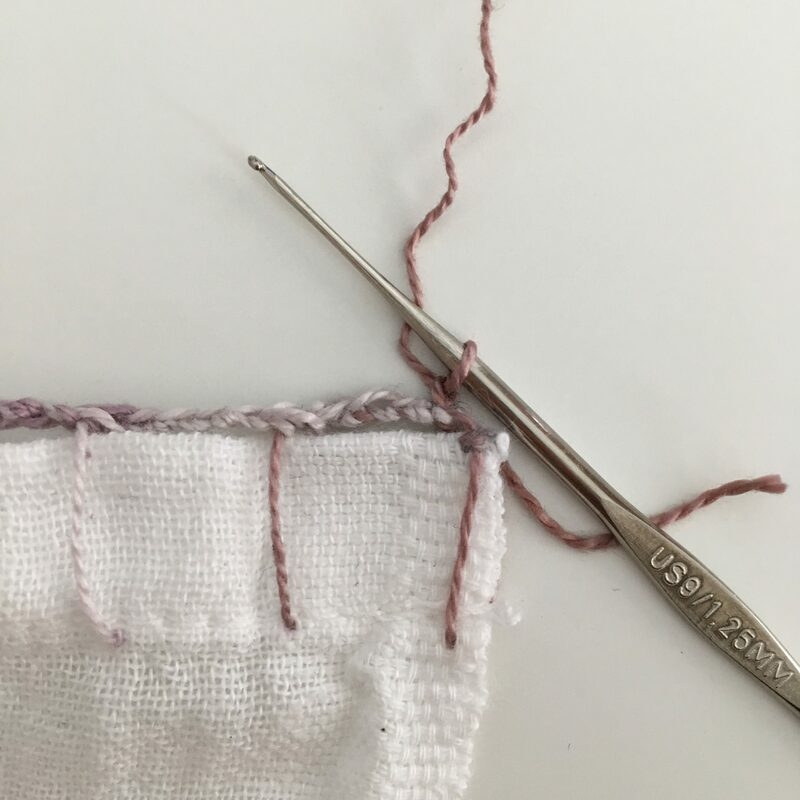 When you get to the end bring the thread through the corner of the towel, and then through its own loop to secure the last stitch and the thread end. Bury the thread in the hem of the towel and, finally, trim end with scissors. 5. Return to the beginning of the towel, and rethread the tail in the needle. 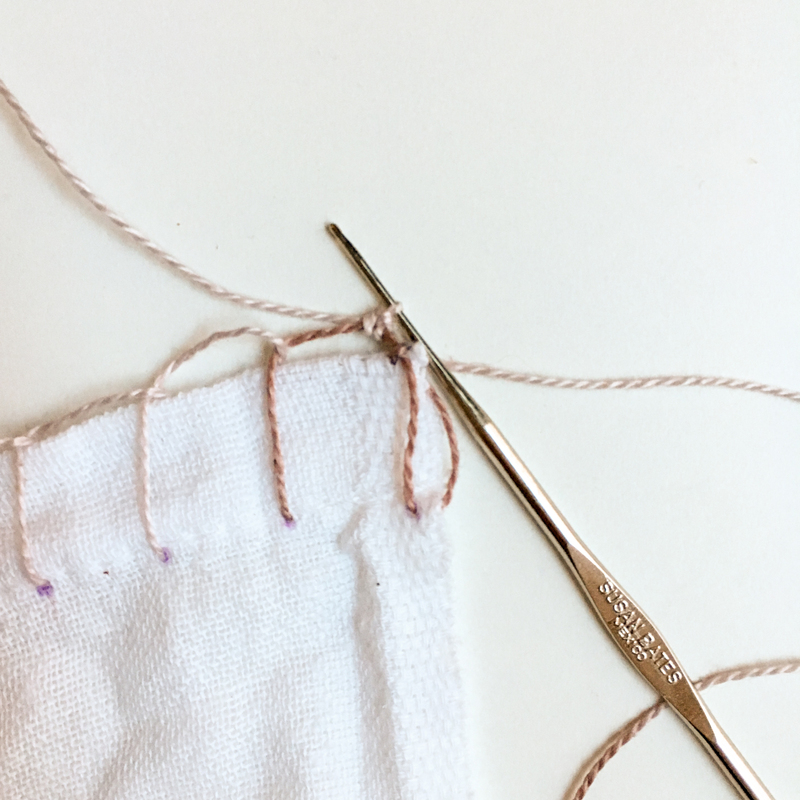 Bring needle through the corner of the towel and through the first initial stitch. 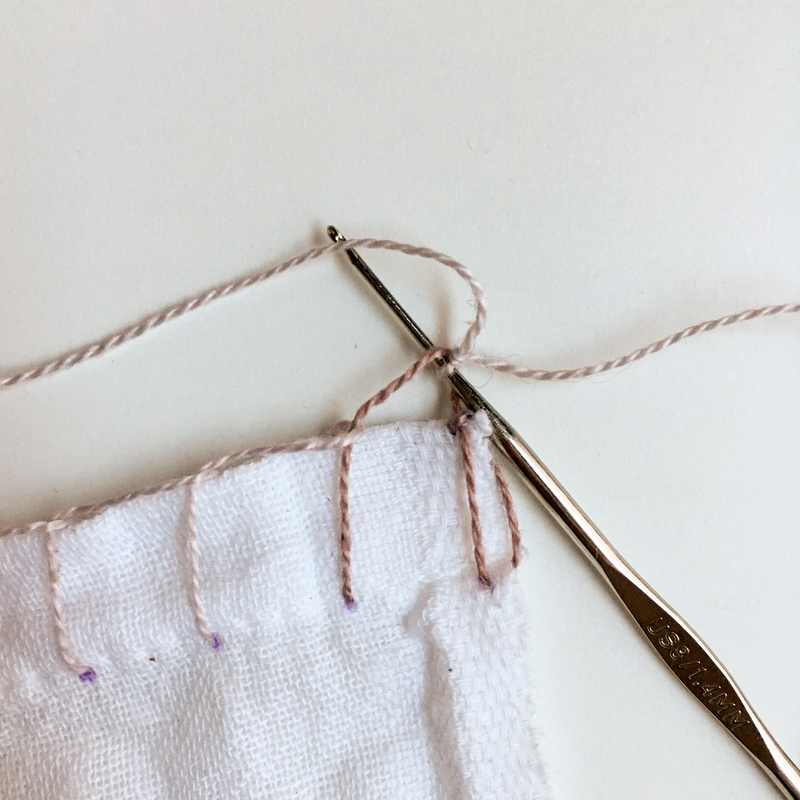 Secure end by bringing thread through the corner of the towel again and bringing needle through the loop you make as you do so. Finally, bury end into hem of towel as above. 1. Make a slip knot on your hook. 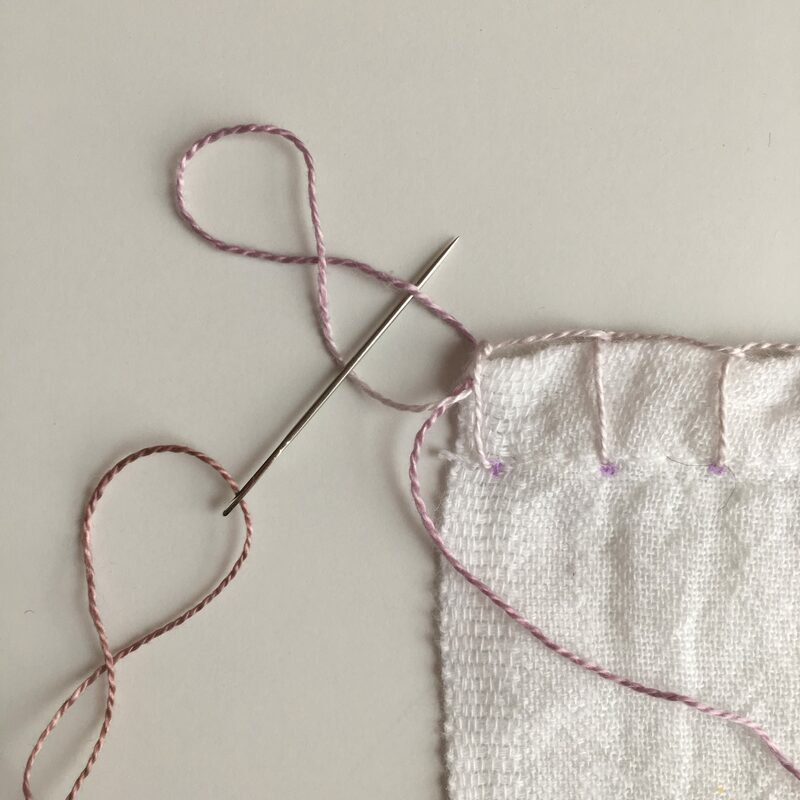 Next, insert your hook under the blanket stitch at the edge of the towel. Finally, complete a single crochet (sc). 2. Work 4 more sc into the same blanket stitch until you have 5 sc in one blanket stitch. Continue working 5 sc into each blanket stitch across the entire towel until the end. Finally, weave ends into the hem of the towel the same way as above. 1) To start the beginning of scallop, single crochet(sc) in first chain. 2) Skip 1 chain and double crochet (dc) 5 times in next chain. 3) Skip 1 chain, and sc into next chain. 4) Steps 2 – 3 make the scallop pattern. Repeat these steps across the towel until the end. To finish, cut the working yarn and pull the end through the last loop on your hook. Finally, tighten and weave ends through hem of towel as described above. 1) For the beginning of the picot edging, complete a single crochet (sc) into first chain. 2) Skip 1 chain. Sc in next chain, chain (3) times. 3) Sc back into the same foundation sc. 4) Skip 1 chain and sc in next chain. Steps 2 – 4 make the picot pattern. Repeat steps until you come to the end of the towel. 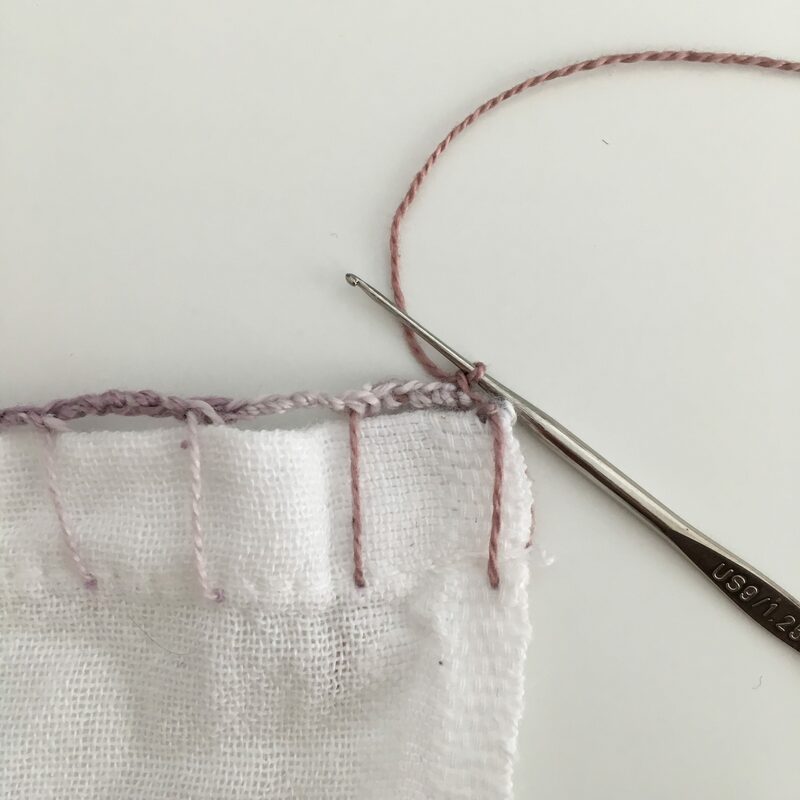 To finish, cut the working thread and pull the end through the last loop on your hook. Finally, tighten and weave ends through hem of the crochet edged dish towel as described above. As a result of your hard work, you have a beautiful crochet edged dish towel or towels to share with those you love! …I´ll start today, so many thanks for that great inspiration !!! Wow, such a great idea! That is beautiful. Antother project put on my to do list. Thanks Anna! I’m glad you like it! Absolutely beautiful! Will definitely be attempting this! Thanks so much Tatiana! I’m so glad you like it! Happy making.